This one is especially for all of you with dry, sensitive skin. I know from my own experience how challenging it can be to find products that your skin not only tolerates, but that keep it healthy and beautiful. This DIY whipped coconut oil cacao body butter is suitable for all skin types, but you will especially love it if you have dry skin. Cacao butter is fat from the cacao bean. It’s the same ingredient that is used to make one of the most delicious things in this world: chocolate. This creamy butter is known for its nourishing, anti-aging properties. It contains healthy fats, oleic acid, the antioxidant polyphenol and vitamins K and E.
Besides hydrating your skin, cacao butter locks in moisture and keeps your skin soft for hours. It stimulates collagen production, improves skin elasticity and is anti-inflammatory. It also soothes skin conditions such as eczema (dermatitis) and psoriasis. Coconut oil offers a lot of similar benefits for your skin. It’s rich in medium chain fatty acids, which deeply penetrate your skin and moisturize it. This anti-aging oil strengthens and helps repair skin tissue, protects against free radicals and contains strong antimicrobial properties. It helps eliminate dead skin cells, reduce wrinkles and relieve sensitive skin conditions such as eczema. 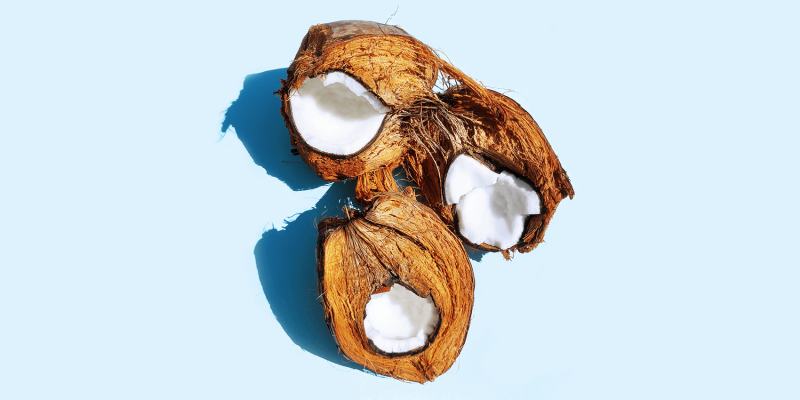 More about the benefits of using coconut oil for your skin. Lavender essential oil is a very soothing oil for sensitive skin conditions such as eczema, psoriasis and acne. It relaxes, has anti-inflammatory, healing properties and helps improve blood circulation. Melt the coconut oil and cacao butter au bain marie in a bowl placed in a pan with shimmering water, while mixing. The cacao butter needs more time, so start melting it first. Remove the oil mixture from heat and let it cool off. Whip it in a food processor until you get an airy, foamy consistency. 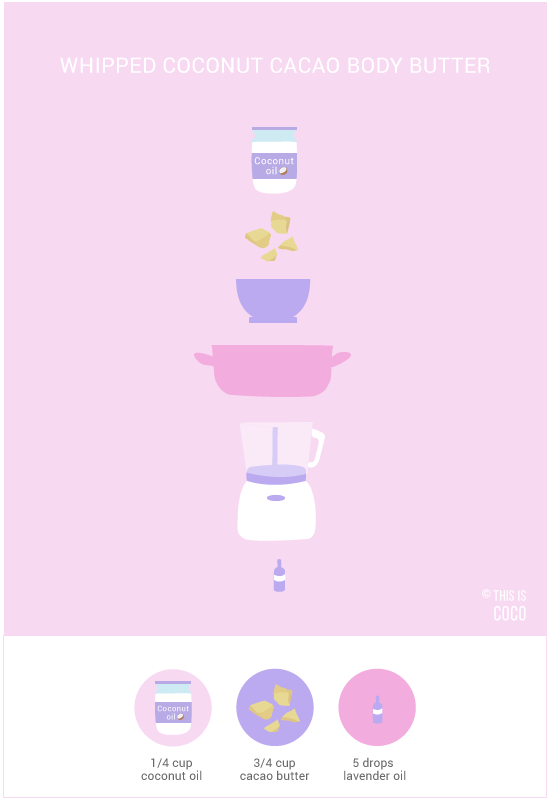 Now you can mix in the lavender oil. Apply the body butter all over your body after showering or whenever you’re in need of some hydration. Store it in a sealed container. I like using glass or hemp plastic which is biodegradable.